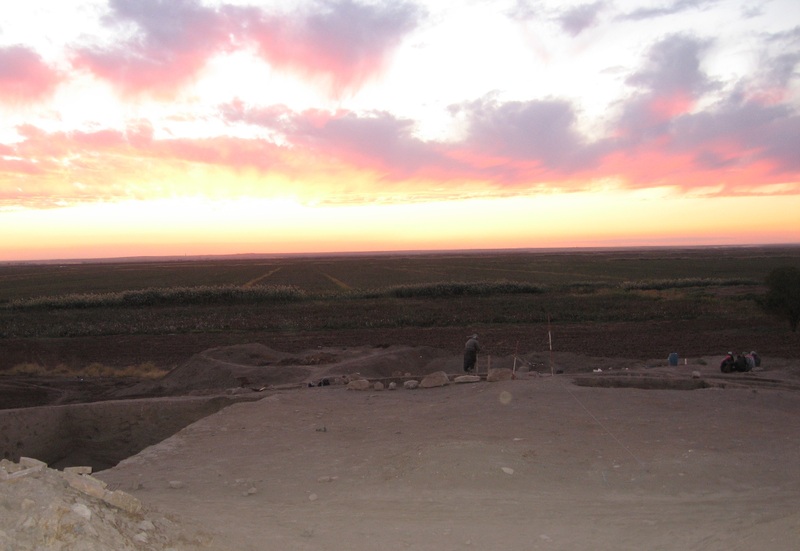 The reason I stayed in archaeology is my first fieldwork season in Syria. Halfway through my undergraduate degree, I found archaeology certainly very interesting and enjoyable, but I had started wondering how relevant it really was to society. Was it not more a sort of elaborate hobby, fun for a while, but not worth spending my whole life on? I was planning to start taking a few non-archaeological modules after the summer break. First though there were ten weeks of fieldwork in the Middle East that I had already signed up for, an opportunity I did not want to miss in any case. So, off I went to rural northern Syria. The archaeological site I went to was a small Neolithic tell (Arabic for artificial mound) with an Middle Assyrian (about 13th century BC) fortress on top. Its name is Tell Sabi Abyad, which translates as ‘mound of the white boy’ – the place is believed to be haunted, although an attempt by some of my fellow students to spot the ghost one night was not successful. 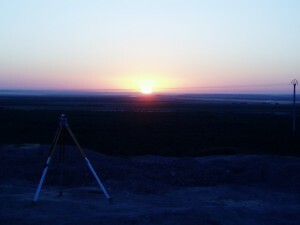 The site is located in what currently is a steppe zone, or an area with a limited amount of rainfall. However, extensive irrigation makes the landscape look rather greener than the Sahara desert many people back home appear to think all of the Middle East looks like! 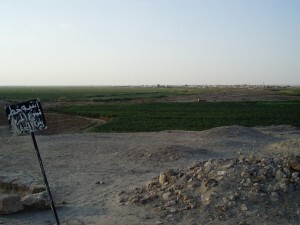 On the photos you can see the green cotton fields surrounding the site. 2. Early morning hot, sweet tea with my team. Later in the season, in October, the very early mornings could be chilly. The site and village are currently in IS area – I very much hope everyone in the village is all right! We arrived in the middle of August, and temperatures were up to a scorching high 40s in the shade. The sort of covering, lightweight clothing Kevin wrote about (http://blogs.reading.ac.uk/sages-advice-fieldwork-gender-careers/page/2/) was certainly essential! We stayed in a traditional mud brick house in the nearby village – very lovely, although also very dusty, as was the archaeological site. In the mornings, the raspy voice of the imam coming from the mosque would wake us around 4 o’clock. This was the signal it was almost time to get up, in order to be on the site before sunrise, so we could do some work before the worst heat would set in. In the afternoons we would mostly work in the slightly cooler excavation house. Not used to the heat and the food, everyone fell ill almost immediately. So, heat, hard work, and sickness. But I loved it. 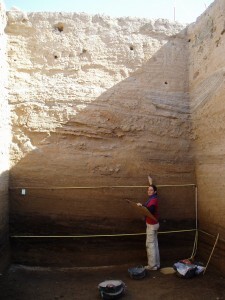 The archaeology was amazing, 8500 year old mud walls, still preserved. In the buildings we found some of the earliest pottery in the Middle East, and many beautiful (as well as less beautiful) artefacts of daily life, like grinding stones, and figurines. The local people were extremely friendly, especially considering they were dealing with inexperienced students who could not speak their language but yet were commandeering them around (or well, trying to). On an almost daily basis we were invited for strong, sweet tea at people’s houses. The other students and archaeologists were also great. While dinnertime political discussions were frequent, in our ‘bubble’ we did not really worry about the global news; generally, we just focused on our daily work and survival. I decided that I did not care if archaeology was not that important to society: I simply loved it and would continue to do it. But more gradually I also realised something else: that in fact archaeology is all about society. We do not just want to find some fancy things (right? ), but we want to figure out what it was like for people to live back then. What did they do? How did they do the things they did? And, mainly, why did they do them? Of course, this is something that I had already learned in my university courses. But, and Duncan also referred to this in his blog (posted on the 5th December 2014), it is the actual digging that can lead to new ideas, or in this case, that can make us really understand the ideas that until then we just knew in theory. Pascal Flohr is a post-doctoral research assistant in Middle Eastern Archaeology, working for Professor Dominik Fleitmann. 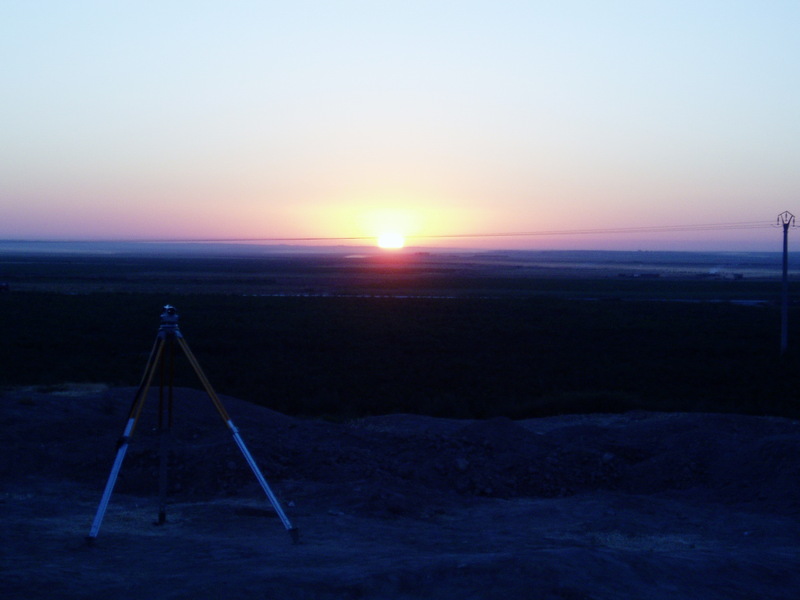 Her main aim is to assess the impact of climatic events on Holocene Near Eastern societies, by compiling and re-analysing existing data using a database and GIS, with a current focus on Early Holocene rapid climate events, such as the 8.2 ka event. Pascal’s doctoral research focused on reconstructing past water availability by using plant stable isotopic composition, with a main aim of reconstructing past water management practices in the Near East. 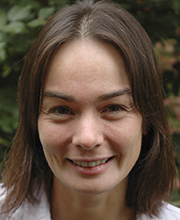 She was involved in experimental crop growing in Jordan (led by the Water, Life, and Civilisation project in cooperation with NCARE), conducted charring and burial experiments with cereal grains in Jordan and the UK, and applied the method to archaeological plant samples from the Jordan Valley. 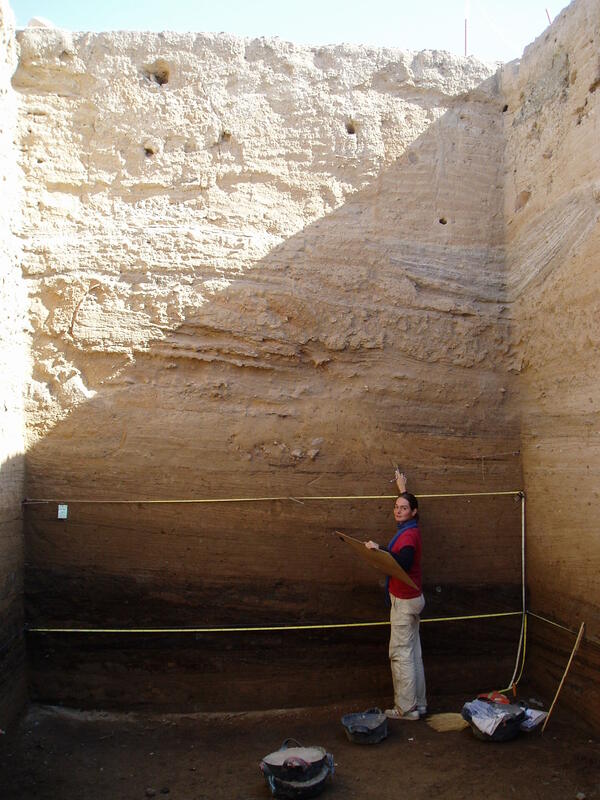 Pascal has been involved in several archaeological projects in the Near East, including the experimental building of a replica Neolithic structure based on the site of WF16, Jordan, and documenting and repairing experimental structures at Beidha, also in Jordan. 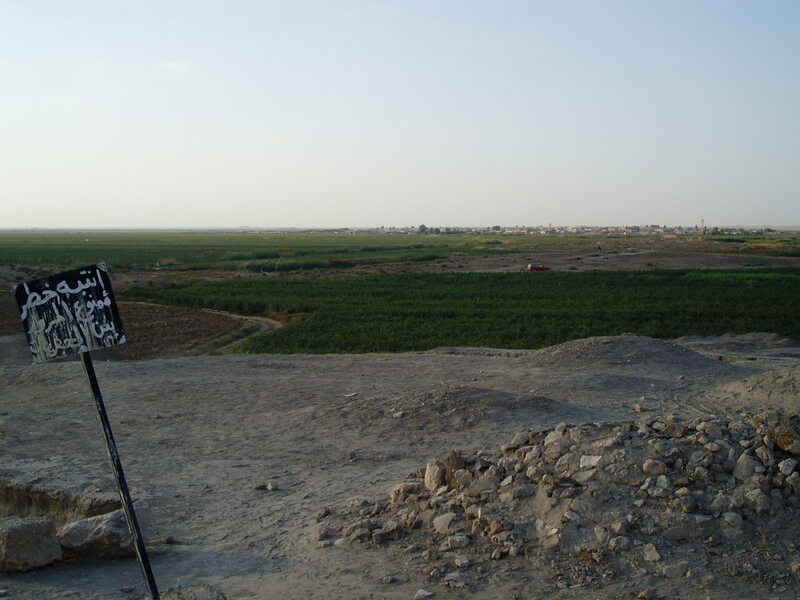 In addition, she has got extensive fieldwork experience in the Near East, at sites like Sabi Abyad in Syria, WF16 and Barqa in Jordan, and Bestansur in Iraq.